I am always on the lookout for the little thing that I can keep in my bag and give to a child who is tired or waiting at a restaurant, doctors office, or meeting. So when I saw this idea from Time to Play I thought it might do the trick. I actually bought the Velcro to make these a long time ago and just never got around to it. If I had realized it would only take me 5 minutes to make them I probably would have done them a lot sooner. 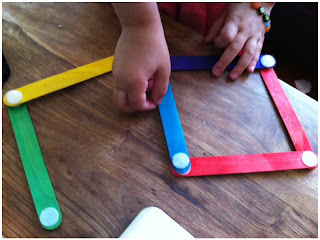 I used some colorful, large popsicle sticks we had and Velcro circles with an adhesive side to make it easy. 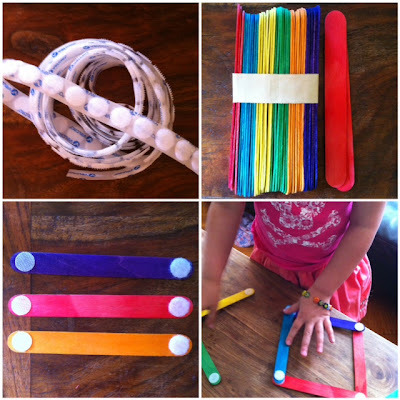 I put one of each part of the Velcro (the rough ones and the softer pieces) on each side of the popsicle stick. I also placed one Velcro circle in the center of a few of the sticks just for a little variety. That was it, I then turned them over to the girls. They quickly figured out that they could stack the sticks to build a vertical sculpture or link the ends together to build a longer sculpture or shape. The sticks stack together nicely and fit right into my bag, perfect for just that moment when you need to keep someone entertained just a little bit longer!